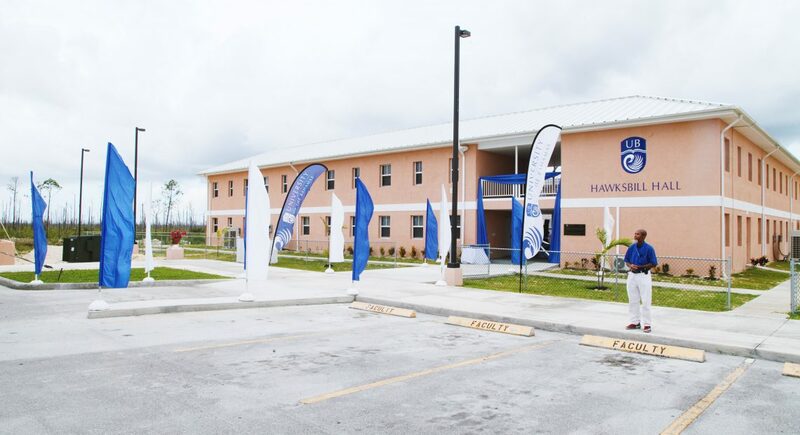 UB NORTH HAWKSBILL HALL DORMITORY OFFICIALLY OPEN – Monday, May 7th, 2018 marked a major milestone for the University of the Bahamas, (UB) Northern Campus, with the official opening of their first on campus residence, Hawksbill Hall. 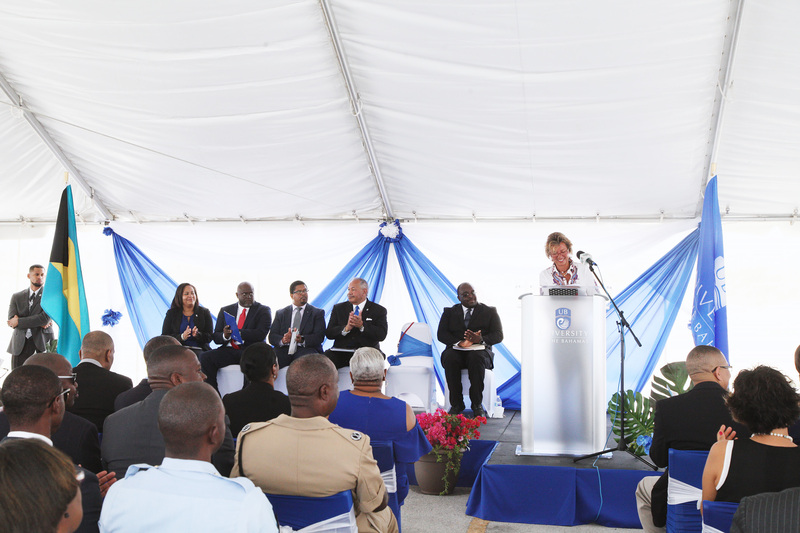 In her remarks, Ms. Sarah St. George, Acting Chairman of The Grand Bahama Port Authority (GBPA), described how the UB Northern Campus was a dream of her father’s and the late Sir Jack Hayward- with their donation of 50-200 acres for the campus, and how “dormitories became a must”, so that in 2015 she and the late Sir Jack together committed $3M towards the total $4.5M cost of the residential Hall, in partnership with the Government. “I hope to see great friendships and great things emerge from this humble building in years to come” she said, reminding students that Facebook was created in a dorm-room, and adding; ‘Out of an acorn grows a Mighty Oak’. Pictured center, bringing remarks: Ms. Sarah St. George, GBPA Acting Chairman; Pictured right to left: Dr. Teo Cooper, Dean of Students; Dr. Rodney Smith, UB President; Hon. 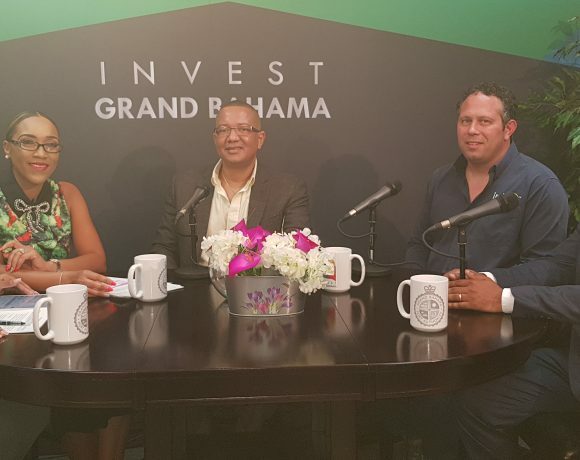 K. Peter Turnquest, Deputy Prime Minister and Minister of Finance; Dr. Ian Strachan, UB North Vice President; Miss Davinia Blair, Vice President of Institutional Advancement and Alumni Affairs. The Hon. Peter Turnquest, Deputy Prime Minister and Minister of Finance; Senator The Hon. Kay Forbes Smith, President of the Senate; The Hon. Iram Lewis, Parliamentary Secretary in the Ministry of Works and Member of Parliament for Central Grand Bahama; The Honourable Pakesia Parker-Edgecombe, Member of Parliament for West End and Bimini and Parliamentary Secretary in the PM’s office; MP for Pineridge, The Honourable Frederick McAlpine; Senior Government Officials, and Island Administrator Don Cornish; Assistant Commissioner of Police, Samuel Butler; Pastor Robert Lockhart, President of the Grand Bahama Christian Council; Rev. Keith Russell and other Members of the Clergy; Chairman of the Board of Trustees for the University of The Bahamas, Dr. Jonathan Rodgers; Dr. Rodney Smith, President of the University of The Bahamas; Dr. Ian Strachan, Vice President, UB-North; Miss Davinia Blair, VP of Institutional Advancement and Alumni Affairs; Faculty, Staff and Students of the UB and UB North; Dean of Students, MC and old family friend, Dr. Teo Cooper; My fellow GBPA colleagues, Ian Rolle, Deann Seymour, my brother Henry St. George, Rupert Hayward- Sir Jack’s grandson and my godson- So many other colleagues and friends here today, Distinguished Ladies and Gentlemen, Boys and Girls, Good Morning! 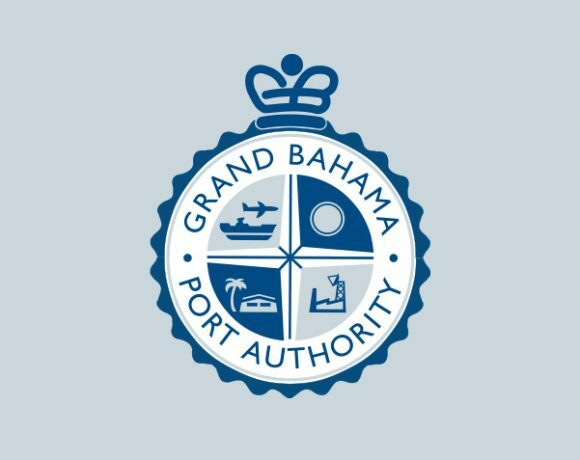 On behalf of the Grand Bahama Port Authority, I’d like to thank the University of The Bahamas warmly for arranging this happy event, and for inviting us all here today! 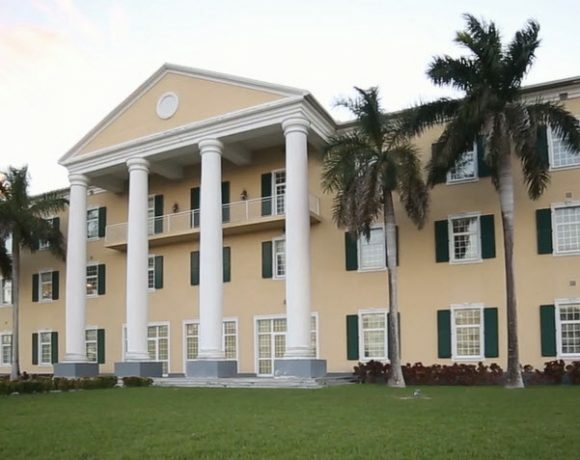 I’d also like to congratulate my good friend UB President Dr. Rodney Smith and the entire UB for realising another milestone – Grand Bahama’s very own campus dorms, to be known hereinafter, as Hawksbill Hall! Dr. Oliver Goldsmith said: “Life is a journey that must be travelled, no matter how bad the Road and Accommodations”. Well, today these new dormitories should make the road a little shorter, and life a little more accommodating for 86 new young aspiring academics. And, especially important for the girls, this also offers a safe and healthy living environment, complete with its own in-house Hall Director, Vivian McIntosh (and you don’t mess with a McIntosh, I know, because we have three at the GBPA!). But whether we’re younger or older I think in Life we all need Mentors. And one of mine, whom I’m privileged to mention, is His Excellency, Sir Arthur Foulkes the former Governor General and one of the Nation’s Founding Fathers. As it happens, Sir Arthur celebrated his 90th birthday last Friday in Nassau in the company of three Prime Ministers, The Rt. Hon. Hubert Alexander Minnis, Hubert Alexander Ingraham and Perry Gladstone Christie, among many other luminaries. As you can imagine, wisdom and wit abounded. Sir Arthur spoke last. He reminded us how fortunate we are today, but noted it wasn’t always thus. He said in the old days most Bahamian children had to leave school at the age of fourteen (14), though he himself managed a reprieve to the age of fifteen (15)! But even in my day, girls mostly left school before eighteen (18). I was a boarder at a girl school in England called Heathfield, where the motto was “The Merit of One is the Honour of All”. And so, if any girl ever got into University, the whole school was given the day off! And I can only remember about two days off in the whole time I was there. Sir Arthur’s remarks on Friday were right on topic, because he said, and I quote, “Despite the challenges which remain in education, today we have thousands of young Bahamians with College degrees, including Doctorates, and of course we now have our very own University of The Bahamas!” End Quote. Indeed we do! My father Edward St George and Sir Jack Hayward both dreamed of this Campus and donated fifty (50) acres to build it. By 2015, it was clear these dorms were a must, so the late Sir Jack and I joined the COB Chairman, and the Minister of Education, to announce that the Government and the GBPA would both commit the funding to make it happen! The GBPA contributed $3 million and the dorms began construction. And then last year, by happy confluence, the COB transitioned to the University of The Bahamas or UB. Now, UB Students from West End and East End can eliminate their long commute by living-in. And ‘Northern Bahamas Campus’ means this facility isn’t just for Grand Bahama, it’s for all the islands of the Northern Bahamas and even Nassau too. So we can look forward to a new Vibrancy! I must also commend Arthur Jones for his tireless efforts to champion this project. He promoted the use of modern building techniques deployed at the Shipyard in their refurbishment of state-of-the-art cruise ships. We introduced Almaco the Finnish experts in modular design, and, together with local contractor Jan Builders, they were able to halve the construction cost, so the GBPA’s contribution represented two-thirds of the total cost rather than the one-third previously mooted. Hawksbill Hall harbours fourteen (14) suites, each containing two (2) double rooms and two (2) singles with their own common room; In total twenty-eight (28) doubles and twenty-eight (28) singles, plus another two (2) double rooms fully-equipped with Handicapped access. There’s one bathroom for every three (3) students, and last week, poor Mr. Beckles accidentally got himself locked inside one, for some time. Thankfully he just happened to have a screwdriver on him – otherwise he might still be there! But Cyril Beckles had done everyone a favour, highlighting a design glitch and now all is well. GBPA’s been privileged to play a major role in the founding of many schools on the island, from Bishop Michael Eldon over fifty (50) years ago to Sir Jack Hayward High and St Georges High; Also Beacon, the old Hawksbill High, Eight Mile Rock High, and Sunland, to name a few. To each High School, we give Top Achiever Awards annually. We also offer one hundred (100) Tertiary Scholarships a year, and about thirty (30) of these scholarships go to Grand Bahama students on UB courses; Among our GBPA Team here today are COB graduates, Roosevelt Rolle a scholarship recipient, Marlene Hepburn, Desmeka Evans and Michelle Riley. But would all the COB graduates here please stand up and take a bow! Education and Practice go hand-in-hand- for example the UB and GB Shipyard joined forces to offer a two (2) year Associate Degree in Engineering; And we may see far more of these Public/Private sector partnerships. I know Greg Wood and Hazel Alvarado are in the audience today, so perhaps new investor, GIBC Digital, might work with UB, to jumpstart our Tech Sector! We also recognize sowing the seeds of excellence early which is why we sponsor and mentor a Junior Achievement Group. You’ve heard the expression – Out of the acorn grows a Mighty Oak! And just a week ago, our Group was awarded JA Company of the Year for the sixth term running! In these weekly sessions, GBPA Volunteers teach young students about business, and how to become Entrepreneurs. But a dorm is a real incubator of ideas; and I remember we were urged to treat ours as “a springboard not a mattress”. Author Eric Ries said; “The Best Entrepreneurship happens in low-stake environments where no one is paying attention, like Mark Zuckerberg’s dorm room at Harvard”. (And one of his clever dorm mates was my successful nephew Antony Clavel, who was Facebook’s 5th member). So I hope to see great friendships and great things emerge from this humble building in years to come. Again on Friday, Sir Arthur said; “Nation-building is a never-ending process in which all of us are engaged, or ought to be engaged”.